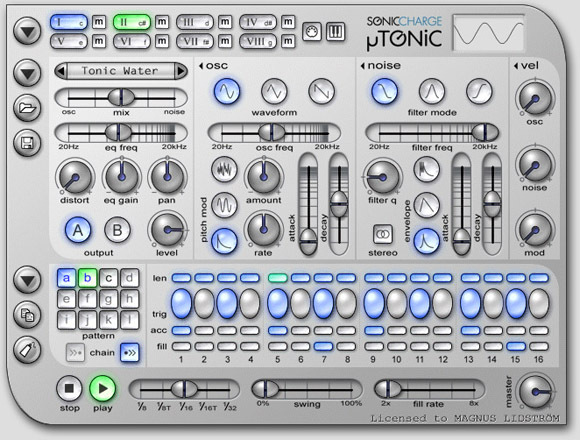 CDM reader subbasshead points on our forums to a newly Intel-native release of Sonic Charge’s MicroTonic beatbox app. Why do we like this app so much? Its elegant interface is the creation of Magnus LidstrÃƒÆ’Ã‚Â¶m, who contributed to Propellerhead Reason, including the MalstrÃƒÆ’Ã‚Â¶m synth (which remains one of the reasons I boot Reason up, even with lots of other sound software around). And I love any beatbox that is entirely synthesized, with nothing pre-rendered or sampled. And assuming you Windows users didn’t just skip over this post, it runs on Windows, too. In other news, not only is this software not dongled, you can order it on a reusable Flash drive. Pricing starts at US$89.